Leaving an undisputed mark on critics and believers alike, this popular bud has been re-shaped, re-tuned and re-produced for true fans. Complete with Supreme Sound, the Ink'd 2 is a remix worth hearing for yourself. Most headphones' bass is either suppressed and muddy or exaggerated and boomy. Skullcandy's Supreme Sound “Attacking Bass” experience hits with punchy and powerful bass that's engineered for your music. You have probably heard headphones with hollow or tinny vocals that sound like they're coming from an AM radio. Supreme Sound lets you hear warm and smooth vocals as if you were standing beside your favorite singer. Skullcandy engineers their headphones to produce clean and spacious highs, not piercing or muted highs like you've probably heard in other headphones. Supreme Sound delivers perfect highs for the final element of an amazing audio experience. Skullcandy's best-selling INK'D earbuds feature a customizable fit and 11mm speaker drivers that tattoo your temporal lobes with full-color sonic art. Select colors include an inline mic and control switch to keep you in touch with your tunes and the outside world. 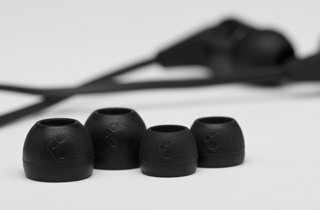 Skullcandy's INK'd earbuds come with three separate sizes of silicone eartips (small, medium, and large) to help you get the perfect fit to go with your sound.